for He desires to grow within your soul. Posting an early Christmas wish. 11 VIEWERS CLICKED HERE TO COMMENT ON THIS POST. YOUR COMMENT WELCOMED ALSO. Another Exquisite holy card. Thanks for sharing each and every day. Very Thankful!! I love the video too~JMJ~Lisa S.
That's what I was going to say: another absolutely stunning holy card of the Christ child. oh I do love visiting you Micki. thanks for these beautiful advent cards. Your glorious holy cards, your beautiful prayers, have made this an Advent like no other. God Bless you, Micki! 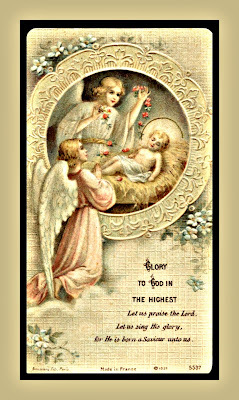 This card is really pretty, I love the artist touch of the Angels gazing so lovingly at the Divine Child! The text is equally moving. Your collection of Holy Cards are like Faberge Eggs, each one is more stunning than the last one viewed. Thank you for you time and effort you so kindly put into this site during this very busy time of year. Hope you are having a Wonderful Day! Peace to you and all your visitors! John K.
Lisa S. - Thank you for your loyalty in visiting here. You are valued. Gardenia - And I love counting on your visit. Thank you for your comments...I'm always anxious to come see what "friends" have to say. John K. - You too are a source of inspiration for us all. I pray you are getting some peace and answers to your search. God bless. Micki, your humility is admirable, but those of us who follow you would have none of the beautiful artistry, and the wonderful inspirational prayers without you and your wonderful collection, your trusty computer, and your willingness to share with us. And we thank you from the bottom of our hearts! Anonymous - All I can say is...can you imagine these holy cards just sitting all by themselves in boxes and albums with no one but me to look at them and be reminded that they represent God's Family Album? 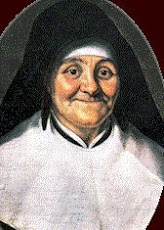 Of course it is much more joyful to share with others and see and hear how they move others besides myself. Thank you ALL for being so generous with your appreciation and one never tires of hearing how they are touched by either words or pictures. Blessings to you all. Thank you for sharing, I like it worth reading. Essay - Thank you and welcome as a commenter. I appreciate that. Online UK Degrees - Thank you. I'm glad you like the words too. 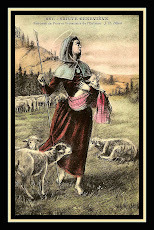 Copyright 2007-2015, "Holy Cards for Your Inspiration"
St. Genevieve , my patron saint for 2009. Saint Genevieve, Pray For Us. 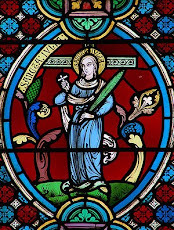 St. Isidore, my patron saint for 2008. St. Isidore, Pray for us. St. Joseph, my patron saint for 2007. 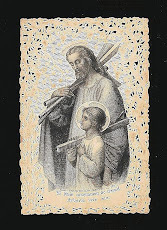 St. Joseph, Pray for us. To see the earlier posts please click on the words "OLDER POSTS" after the last holy card you see scanning down to the bottom. When I first started blogging I had no idea what my focus would be. 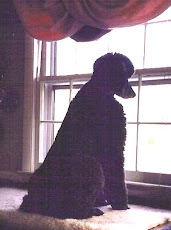 Unlike Chelsey, our standard poodle, who had her focus on keeping us safe from the outside world. That’s why I named the blog The Window Shows it All. I later decided sharing my holy card collection would be my goal and that’s why my computer address is not Holy Cards for Inspiration. Click on a flag, then when the next page opens click on flag to learn about that particular country.